"My name is Maximus Decimus Meridius." 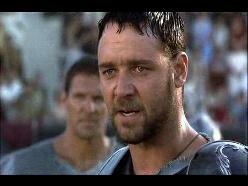 Easily the best scene in Gladiator. The 73rd annual Academy Awards, for the film year 2000. The nominations were announced on February 13, 2001 and the awards were held on March 25, 2001. The Race: When Steven Soderbergh’s Erin Brockovich was released in March of 2000, it captured the box office of a soft spring with ease but it wasn’t being talked about as an Oscar contender. What it had going for it, aside from the box office (where it had made more in its opening weekend than the two more acclaimed films of the spring – Wonder Boys and High Fidelity – both from formerly Oscar nominated directors), was the performance from Julia Roberts as Brockovich herself. That was getting attention as a potential Oscar contender, and maybe even the role that would turn the box office star into an Academy Award winner. Then, at the start of May, came Gladiator. The new film from Ridley Scott, with Russell Crowe riding high on the acclaim for his performance in The Insider started garnering a lot of attention. Unlike the year before, where there was a clear box office champion (Phantom Menace) and a clear critical sleeper (The Sixth Sense), the summer had nothing in either category, so Gladiator, in addition to becoming the biggest film of the summer, started getting some comparisons to Braveheart and talk began that Dreamworks could start thinking of it as an Oscar contender. This lead to confusion as Dreamworks had a major Oscar contender planned and a strategy. Cameron Crowe had his first film since the Oscar nominated Jerry Maguire coming out in September, on the same kind of release pattern that had ended up with Oscar gold the year before for American Beauty. But when Almost Famous came out, it had the great reviews, but didn’t have the box office appeal of Jerry Maguire, or even American Beauty, or even the director’s cut of The Exorcist that came out the next week. Dreamworks continued to push it for the year end awards, but the strategy, if it was working with critics, wasn’t bringing in audiences. Then in October came a real British sleeper. Billy Elliot was a film from a first-time director (Stephen Daldry) about a young British boy who becomes a ballet dancer. But it was a hit at the art house theaters and an even bigger hit with the critics and it started to generate some awards buzz at a time when the awards films usually start coming, but nothing was in the pipeline. Even November saw only two major Oscar contenders, neither one really designed to much escape the art-house scene: You Can Count on Me, starring Laura Linney as a woman whose wayward brother returns to town (which seemed headed much more for the Actress and Original Screenplay races than Best Picture) and Quills, a film about the Marquis de Sade starring 1996 Best Actor Geoffrey Rush, 1999 Best Supporting Actor Michael Caine, and Joaquin Phoenix, hot off the success of Gladiator. The awards season kicked off with the National Board of Review giving their Best Picture award to Quills. Their Best Director went to Steven Soderbergh for his direction of Erin Brockovich and for his drug epic coming out at Christmas called Traffic, adapted from a highly acclaimed BBC mini-series. Their Top 10 included Traffic, Billy Elliot, Gladiator, Wonder Boys, You Can Count on Me and Sunshine, a small art-house film with Ralph Fiennes that had been released back in January, just too late for the previous year’s awards season. The New York Film Critics then confirmed Traffic as a major Oscar contender, awarding it Best Picture and giving Soderbergh its Best Director award for both his films. But the LA Film Critics, who also awarded Soderbergh, gave their Best Picture to what was quickly becoming the most talked about film: Ang Lee’s Crouching Tiger, Hidden Dragon. 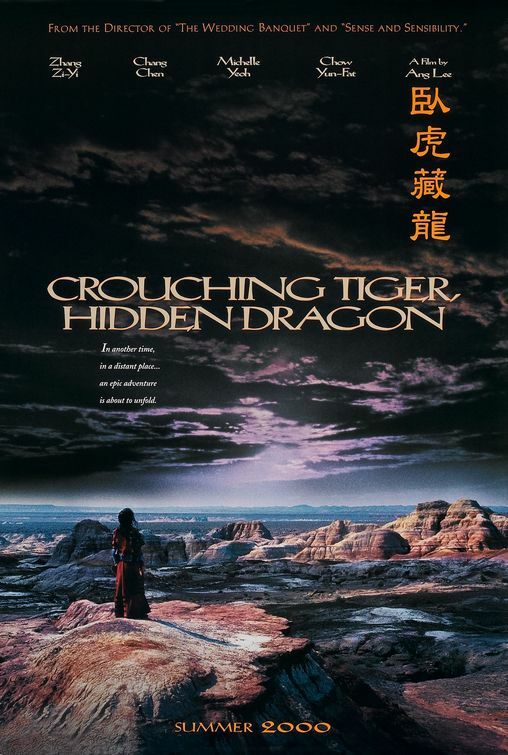 Crouching Tiger was an epic martial-arts film starring Hong Kong action stars Chow Yun-Fat and Michelle Yeoh. It had won Best Foreign Film at the NBR and finished in second-place in the Picture and Director races at New York and the planned slow roll-out to art-house theaters was quickly being pushed up wherever it could. Then came the Golden Globe nominations and while Crouching Tiger was ineligible for Best Picture, it was in the Director and Foreign Film races. Nominated alongside it for Best Director were Best Picture – Drama films Gladiator, Traffic, Sunshine and Erin Brockovich while Almost Famous (Best Picture – Comedy nominee) was nominated for its Screenplay alongside Traffic, Quills, Wonder Boys (Best Picture – Drama nominee) and You Can Count on Me. Almost Famous‘ biggest competition in the Comedy category was two films that hadn’t yet come out: Chocolat, a romantic comedy from Lasse Hallstrom (Oscar-nominated the year before for The Cider House Rules) and O Brother Where Art Thou. Chocolat had the Miramax marketing machine behind it and O Brother had the critical might of the Coen Brothers and popular appeal of star George Clooney. But just after the Globe nominations, Almost Famous took home Best Picture and Director from the Boston Society of Film Critics, giving it an extra boost. After that was the Broadcast Film Critics Awards. Since they had begun their Best Picture nominees (10) in 1996, only one film had managed a Best Picture nomination without a BFCA nomination first, Secrets and Lies. All of the expected contenders were there on the list: Traffic, Crouching Tiger, Almost Famous, Gladiator, Wonder Boys, Erin Brockovich, Quills, Billy Elliot and You Can Count on Me. Riding on the coattails of Traffic, with a Best Director win for Soderbergh for both films at the BFCA, Erin Brockovich was now a major Oscar contender and Gladiator won Best Picture at the BFCA, nearly guaranteeing it a nomination at the Oscars. Next up were the guild nominations. Only one film had DGA, PGA, WGA and SAG Ensemble nominations: Almost Famous and as only one film had ever received all four and not earned an Oscar nom (Being John Malkovich), this was almost a guarantee. Crouching Tiger and Erin Brockovich were both in the PGA, DGA and WGA races, Traffic had DGA, SAG and WGA noms and Gladiator was in the SAG, PGA and DGA races. Still with hopes in the race were Billy Elliot (SAG, PGA, WGA) and Chocolat (SAG, WGA). Then came the Golden Globe awards, with the big awards split among the biggest four films: Gladiator (Picture – Drama), Almost Famous (Picture – Comedy), Crouching Tiger (Director) and Traffic (Screenplay). All that remained to be seen were whether the Miramax marketing (Chocolat), the small little British film that could (Billy Elliot) or a surprise film could knock out any of the expected five. But one of the question going around that no one seemed to have the answer to was this: could Soderbergh be nominated twice? In 1938, Michael Curtiz had been nominated twice for Best Director. But, according to Inside Oscar, the reference book that everybody loves and quotes, but which has NO LISTED SOURCES, in 1939, the Academy changed the rule so that no director could be nominated more than once (much like the acting races). This helped to explain how in certain years when a director had more than one film nominated for Best Picture (like Victor Fleming in 1939, John Ford, Alfred Hitchcock and Sam Wood in 1940, Wood again in 1942, Francis Ford Coppola in 1974 and Herbert Ross in 1977) they had only received one Best Director nomination. Inside Oscar never listed the rule as being revoked, so no one was quite certain. The Results: Dreamworks had the biggest film at the Oscars; Gladiator had 12 nominations. But it had also failed; Almost Famous had four nominations and was expected to win Best Original Screenplay, but it had no nominations for Picture or Director. The power of Harvey Weinstein to woo the Academy had triumphed, with Chocolat bouncing Almost Famous out of the Picture race. In the meantime, Billy Elliot knocked it out of the Director race. Erin Brockovich and Traffic were both in the major races (and Soderbergh was indeed nominated twice). And Crouching Tiger had set a new record for a Foreign Film with 10 nominations. It would not be a third year of Dreamworks vs. Miramax, as Chocolat was dismissed as a contender, not having a Director nomination. Instead, Dreamworks was up against Sony Pictures Classics, with it’s second Picture nomination ever (Howards End was the first) and USA Films, with its first. 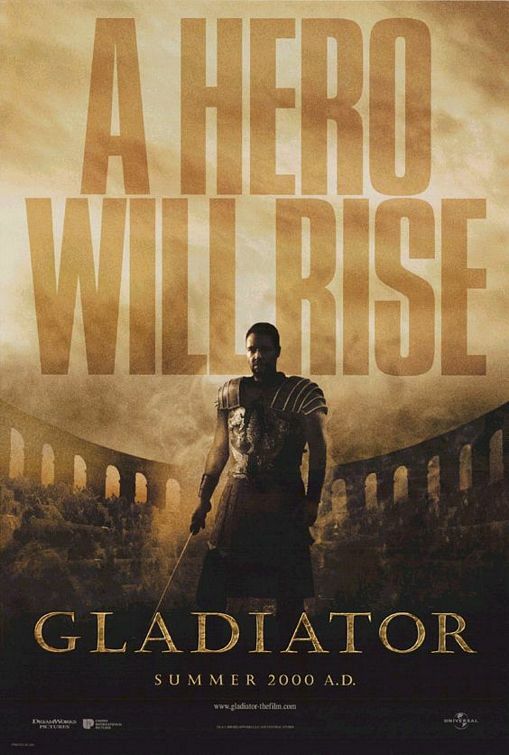 Gladiator had the advantage of being on DVD, but Crouching Tiger and Traffic both had momentum from critics wins and were still earning good money in theaters. With Crouching Tiger in the Best Foreign Film race (and nearly guaranteed to win), it wasn’t likely to win. That left Traffic, whose momentum swelled a little with the WGA win, but diminished a little when Ang Lee won the DGA. But Gladiator continued to add to its wins at the BAFTAs and the PGA and no film with the most nominations in the year had lost Best Picture since 1991. On the actual awards night, momentum swung back and forth. Gladiator won several early awards (Sound, Visual Effects, Costume Design), but then started losing award after award – Cinematography and Score to Crouching Tiger, then Original Screenplay to Almost Famous. Then came the bigger awards and things looked bad for Gladiator. Traffic had not only won Best Adapted Screenplay, but had gone head to head with Gladiator in three categories – Supporting Actor, Editing and Director – and won them all. No film had won Best Picture without either a Director or Screenplay Oscar since All the King’s Men in 1949. But after taking home Best Actor for Russell Crowe (widely perceived as a consolation Oscar for not winning the year before), it was Gladiator that triumphed. Traffic had become the first film since Jaws to win every nomination except Picture and the first film since A Place in the Sun in 1951 to win Director and Screenplay but not Picture. Best Picture? Over Crouching Tiger and Traffic? It vexes me. The Film: Since I hadn’t seen the film in over 10 years, there wasn’t a lot I remembered going back to it. I remembered the great lines, of course, because they are not only the best lines in the film, and some of the best of the year, but one hell of a dramatic movie moment: “My name is Maximus Decimus Meridius, commander of the Armies of the North, General of the Felix Legions, loyal servant to the true emperor, Marcus Aurelius. Father to a murdered son, husband to a murdered wife. And I will have my vengeance, in this life or the next.” And I remembered before the final brutal fight, that Commodus stabbed Maximus. (I also remembered the truly horrible line “I am terribly vexed.” That I remembered it as “I am most vexed,” does not diminish how truly bad the line is or how bad Phoenix’s delivery of it is.) Remembering the two moments, obviously the first, with its big moment of revelation must come before the second. But I seemed to remember the first as the emotional high point of the film, coming not long before the second. Imagine my surprise, watching the film again, to watch the first scene, look down at the counter, and realize that the film is only half over. All of this is to illustrate a couple of points. The first is that this film is too damn long. Not because it is over two and a half hours. But because its story does not require it to be so long, because it lags in so many points and because it feels so damn long. Look at the opening scenes of the film, the battles in Germany that function as a prologue to the film. They take over a half hour. Yes, Richard Harris is effective (ironically, I pictured him as Duncan in MacBeth long before this film ever came out and this proves that he would have been an effective one), but it takes way too long to get to his death scene and to proceed from there. So much of the pacing in this film is done all wrong. We drag until we get to Maximus’ flight from his death sentence, then, suddenly, we rush through the next few scenes and he’s somehow off in North Africa with no reasonable explanation as to how the hell he got there. It was like they wrote in the script, Maximus becomes slave, and then figured, ah, the hell with it, people watching this film don’t really care about the details, the excitement of the battle scenes and the effectiveness of Russell Crowe’s acting will take over. That they do, to some extent, do exactly that, is testament to Ridley Scott’s abilities as a director and Crowe’s abilities as an actor, more than any other qualities of the film. But that was all they bothered to do – rely on the talent involved. In films such as Ben-Hur and Spartacus, they developed the characters, they developed the villains, the heroes, the relationships between them. Here, we have a cartoon version of the evil Emperor (making him more of a Caligula), straight down to the cartoon performance from Phoenix. What we have instead are long, blood-soaked, muddy, dark, dank action scenes. You could make the argument that this is what the actions in the Coliseum would have looked like – all confusion and desperation. But this isn’t a film that’s really all about the historical feeling, so why bother with doing that? I mean, look at how the characters are dragged from Spain to North Africa to Italy and, conveniently, everyone speaks the same language, usually with the same accent. If this film wasn’t going to be a history lesson in any way, shape or form, why not give us action scenes that actually flow, instead of looking like ridiculous special effects? I don’t hate Gladiator. For parts of it, it is definitely entertaining, and at the heart of it, it does have a solid performance from Russell Crowe, one of the few actors who could really pull this kind of thing off (and he does get that really great line, though they kind of waste it by putting it in the middle of the film). But in the end, it is too long, too much of a mess, too badly written and there just isn’t enough to hold it together. It vexes me. But I’m not terribly vexed, because that’s just a stupid thing to say. Sets a new record for Oscar noms for a Foreign Film. Probably too much to hope for that it would win Best Picture. The Film: In late 2000, Veronica and I saw the trailer for a film we were unaware of. It was directed by Ang Lee, the man responsible for Sense and Sensibility (my #1 film of 1995) and The Ice Storm (my #2 film of 1997) and it seemed to rely on the visual sensibilities of The Heroic Trio (one of Veronica’s favorite films and one which she loaned me before we even started dating). Then it started getting awards attention, winning Best Picture at the L.A. Film Critics and getting Director and Foreign Film nominations from the Golden Globes. It suddenly seemed to be the film to see, with just one problem. It had a release date in Portland that was locked in at Cinema 21 and their schedule didn’t allow for it to move up like was happening in other cities. So, thanks to the magic of Fandango, we figured if we can’t see it in Portland for two more weeks, we’ll go to Seattle and see it there. So we did. It was one of the most worthwhile trips to Seattle I ever made, even if we did almost get stuck over night, as we barely made it back to the parking garage before they closed for the night. It wasn’t just the best film I had seen all year. It was the best film I had seen in a decade. This was the kind of film that delivered on everything that The Princess Bride promised: “Fencing, fighting, torture, revenge, giants, monsters, chases, escapes, true love, miracles…” Well, it didn’t actually have giants and the monsters were more metaphorical. But it was all that you could possibly hope for in a film. Here was a great story, both with action and love, with amazing direction, incredibly well-written, with first rate acting and technical achievements that were second to none. This was exactly the kind of film that people wait their whole lives for. The story works so well because it functions on so many levels. There is the passion of youth, the wisdom of experience, the desperation of the heartbroken, the anguish of the parted lovers, the long sought after revenge, the deeper reasons behind the revenge. None of the characters are much in the way of talking. That we learn so much about the depths of these characters is a function, partially of how well the script works, and partially of how good the performances are. I am reminded of Norma Desmond and her notion that they didn’t need words, they had faces. There are certainly those people who never saw Crouching Tiger because they didn’t want to see a Foreign film, didn’t want to have to read the subtitles, when that was never really necessary. All you had to do was the read the faces of Chow Yun-Fat and Michelle Yeoh to see how much they loved each other, how much they had each sacrificed to live their lives with honor, but how much it clearly hurt them both. Or look at the scene where the policeman’s daughter comes out of the hut at night to ask the guard to come inside, out of the cold. She is tired, shattered by the death of her father. He is haunted by his failure to stop the death, to stop even the escape of the criminal who killed her father and wants to make up for it. Part of how he does that is by following her inside. So little needs to be said between them. “Come inside,” she entreats him, and he follows her, and the specific (a moment between two people outside in the cold with almost no dialogue) becomes the universal (the way we cling to each other when we have lost the ones we love, how human contact can counteract human suffering). Just the main story of this film would have been enough. We have the lonely samurai, out for years longing to avenge the death of his mother, spurning his chance for love in order to avenge his honor. We have the woman who so desperately loves him, but dare not utter a word of it because she understands him so well. We have the others who seek their own bit of revenge, and how all these characters intersect in battle with the hunted. Then, of course, we have the hunt for her, and the final stand-off, handled so well, so quickly, that everything is over before we even know it. That alone has incredible action, gorgeous cinematography, well choreographed fight scenes, revenge, love, lust, pain, anger, jealousy. But then there is the girl. The girl who is engaged to be married to an important man but whose love is buried out in the desert. The impetuous girl who will steel a priceless relic because she is young and she is thrilled by the notion, and because she is so talented that she can get away with it. All of this not only adds an entirely new dimension laid over the first part of the story (we actually get her love story in the film, part of which underlines the notion of the passion of youth, as opposed to the back story of the two older characters, that we only get in story). It is her theft that sets the story in motion, her redemption that fuels the story’s conclusion. And what about that ending? Should I not dare say the ending in case there are those who haven’t seen it? But who would dare love film enough to read my reviews and not have seen Crouching Tiger? Who could not know how it ends. How this film is so much more true to its characters and its story than Hollywood would have been. That it carries untold sorrow (the cliche of someone dying in their lover’s arms is so ridiculous, yet, here, carries a poignancy beyond any film I have ever seen), yet considerable ambiguity (in its closing shot) adds to its list of strengths. But then, even aside from the writing (which is first-rate), the directing (which is beyond first-rate) and the acting (easily the best performances from either Chow-Yun Fat or Michelle Yeoh and it introduced Zhang Ziyi to American audiences with one hell of a performance), there are the technical aspects of the film. The film won Oscars for Best Cinematography (easily deserved, with the perfect framing of the fights, whether in a tavern or the trees), Original Score (haunting and beautiful) and Art Direction (wonderful sets). It was also nominated for Editing (it perfectly balances the stories, and moves to the past with grace and ease) and Costume Design (beautiful costumes – far better than the winner Gladiator), both of which it should have won. It somehow wasn’t nominated for its Sound, or, stranger, its Visual Effects. Some would look at the Effects as coming from The Matrix, but they come much more from the Hong Kong tradition that Michelle Yeoh had been a part of in The Heroic Trio. Unlike The Matrix, where it’s so obvious that they are computer effects, here, the actors seem like they’re actually doing these moves (because they are – the only computers involved were deleting the wires). Rarely does a film have such great effects that so seamlessly blend into the action and flow. So, here it is. The winner of a record 14 Nighthawk Awards. Because in addition to everything else, it even has a beautiful Original Song thrown in, “A Love Before Time,” better even than the Bob Dylan song written for Wonder Boys. All together, it makes for one hell of a film, one of the best I have ever seen. It doesn't win Best Picture. No big deal. Only the first film to win Director and Screenplay without winning Picture since, oh, 1951. The Film: I watched this film in its opening week and then didn’t see it again until last week. When I re-watched it, it was on the same day that I watched Soderbergh’s latest film, Contagion. What was astounding wasn’t that Traffic and Contagion used basically the same structure. What was astounding was how they both used it so well. Both films balance multiple story-lines, across different countries, with several main characters. But what neither film does is allow us to lose sight of who the characters are. This is a process, both of the writing, but also of the editing and the direction. No part of the story is given any more weight than any other side. And both films allow us to understand the characters, to see the human cost, whether it be of drugs, or disease. Traffic follows three different stories: a judge in Ohio who becomes the Drug Czar, a cop in Tijuana who is valiantly trying to do something about the drug trade that is wasting away his country, and a DEA agent and the drug kingpin he is trying to nail. We watch as the drugs begin in Mexico, as they get imported into the states by the kingpin and how the Czar’s daughter ends up hooked on drugs (“It’s easier for someone my age to get drugs than it is to get alcohol” a friend of the daughter explains to the Czar). The film works so well because it never assumes that one story is more important than the other. All three progress towards, well, towards nothing really, but that’s kind of the point. Unlike Contagion, which has a definite endpoint, after the virus has a vaccine, there is no end to the drug trade anywhere in sight at the end of the film, and so this film, much less horrific than Contagion, could also be said to be much more pessimistic. The Drug Czar is played by Michael Douglas in a performance that few others could have given. He has that perfect blend of arrogance, but political aptitude, presence and character. He is the exact type of person you expect to be in that position, but he can also play so well the desperation when all he wants is to get his daughter back. The police officer is played by Benicio Del Toro in a performance unlike anything else in his career, perfectly balancing the cool confidence we have seen in other roles, with a quiet fear, as he knows the true score and the larger stakes at play. All of the scenes in Mexico are filmed in a washed out way, the dust and wind blowing in our faces, letting us see the sense of desperation and tragedy going on in a land where the drug trade (and the numerous murders that have stemmed from it) have made law and order obsolete ideas. 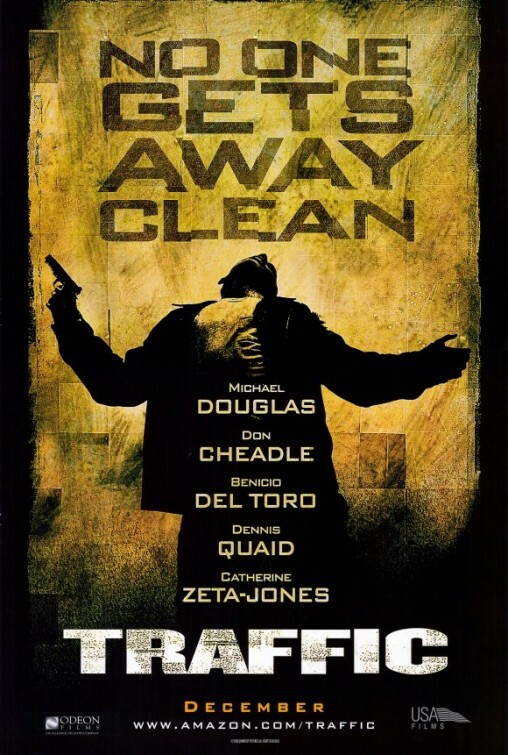 The third story has Don Cheadle as a DEA agent who will do anything he can to stop the drug trade. We also see his partner, played by Luis Guzman (both actors had been in Boogie Nights and perfectly transition from Anderson’s type of ensemble to Soderbergh’s with ease). They are after a drug kingpin, whose wife, played by Catherine Zeta-Jones (who is okay, but when compared to the other major players, is definitely the weaker link in the film’s acting) will do anything to keep her husband out of jail. Traffic is a brutally honest film, both in the cost (the lives lost and the lives wasted) and in the waste we provide trying to fight the endless war. That it takes a step back and simply looks at the drug war that has been fought for three decades now is part of its strength. But it takes a Soderbergh to figure out how to make all these pieces balance together in a moving film. My patience with Harvey runs dry. That this got nominated in place of Almost Famous is ridiculous. The Film: Picking up the film from the Media Center, the head of the Center told me “This is the film that made me realize the Academy had lost it.” We all have films like that (my own response was that Braveheart was that film for me). There are films that really get people’s goat when they earn nominations. To me, Chocolat isn’t that film. After all, it’s a date film, a nice charming romantic comedy, with likable performances, solidly made. Not Oscar worthy, not even in the same ballpark, but not a bad choice, not a film like Braveheart or Scent of a Woman. The bigger problem with Chocolat is that it was the power of marketing. Harvey worked like hell to get a film in the final five and All the Pretty Horses certainly wasn’t going to be that film. So they pushed like hell, made certain that every Academy member saw the film and it slipped in. Sometimes that’s okay, if the film is good enough and if the film that gets bounced is a marginal choice. But it wasn’t and it wasn’t. Chocolat, a good, but not great, or even very good was in. Almost Famous, a great film, was out. So what is Chocolat? I’ve already said it. It’s a date movie. It’s a romantic comedy that’s charming but stresses the romance more than the comedy. It has a good-looking actress and a heartthrob of an actor, and does well because it gets one of each who can really act. Then it fills in the gaps behind itself with character actors, the kind of people who end up with Oscar nominations for supporting roles. 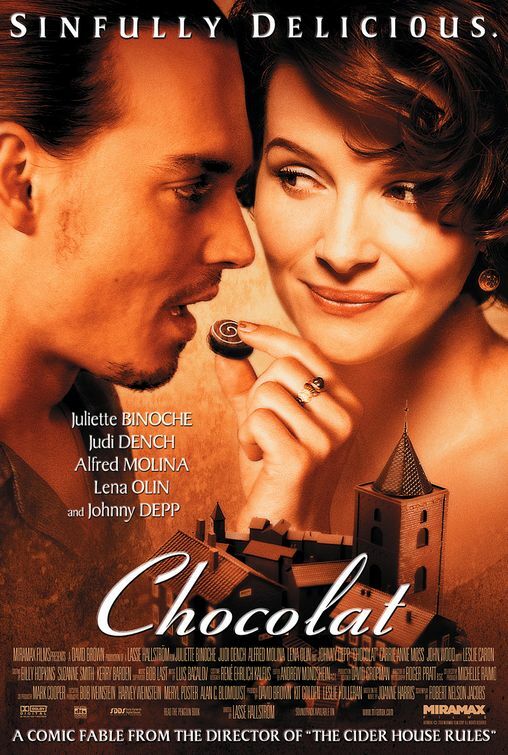 So we have Juliette Binoche, as the chocolatier who comes to a sleepy, religious little town in France that is starving for some romance and some life. We have Johnny Depp as the river rat, a little bit of rebel, a little bit of romantic lead, all of Johnny. Then in the background we have Judi Dench, doing those things that Judi Dench is so good at (so good that even though this performance is a bit of a letdown after Mrs. Brown and Shakespeare in Love that she still managed to earn an Oscar nomination and even win the SAG). We have Alfred Molina, one of those great unheralded actors as the mayor of the town (and de facto priest, as he actually writes the sermons said on Sunday). We have actors like Lena Olin, Leslie Caron, Peter Stormare, Carrie-Anne Moss (in her first prominent post-Matrix role and you find yourself staring at her deeply blue eyes and wondering where the hell you’ve seen her before, but not thinking to picture her in black leather). We also have some nice cinematography, some nice sets, a nice charming score. In short, everything is nice. Even the things that look like they might be bad (a wifebeater, the mayor getting ready to run Binoche out of town) turn out to not be so bad. It’s just another one of those films that could have used the lines from “Comedy Tonight”: “And a happy ending of course.” We know we’ll reach it in the end. We know there won’t be too much in the way. It’s a date movie, after all. The kind of thing you can bring someone to and know that nice things will happen afterwards. Nice things, like, sometimes, an Oscar nomination. Really Academy? This is the film you wanted for the first double nomination for a director since 1938? The Film: Like The Green Mile, from the year before, this is a throwback to a different era. But, in a sense, it is also a film of its era. Certainly it follows on A Civil Action and The Insider, from the previous two years. It follows the story of one person who makes a difference in other people’s lives because she cares about what happens to them and she is willing to dedicate the time and energy needed to help them. At the heart of the film is a performance from one of the world’s biggest actresses, a role that was almost designed to win her an Oscar. It won everyone over and it did, in fact, win her an Oscar, in a rather weak year. Does any of this make Erin Brockovich less of a film? Nothing in particular. But does any of it make it a great film, a film worthy of Oscar nominations for Picture, Director and Original Screenplay? Well, no. But it does point to some of the oddities of the voting populace of the Academy of Motion Picture Arts and Sciences. Take Out of Sight, also by Soderbergh. It is a great film. It won Best Picture and Director at the National Society of Film Critics and won Best Adapted Screenplay at the WGA. But it failed to earn Picture or Director (or Actor or Actress) nominations from the Academy. Yet, could you really find people who believe that Erin Brockovich is a superior film? But here is Erin Brockovich, with all these major nominations. And yet, when it came down to it, it lost Best Original Screenplay to Almost Famous, a film that the Academy did not nominate for Picture or Director. So how did this film get nominated? And what should we think about the film, and the nomination? Well, the nomination could have been a lot worse. It’s a better film than The Green Mile, which was nominated the year before. It moves well along, it involves us emotionally, it is well acted (Roberts is indeed very good, and though she’s not my winner, she’s certainly not a bad choice) and it gives us that great feeling at the end, where things start to get a little better for people who deserve it. The film is solid, not great, not even very good, but solid enough (though not nearly as bad as Ebert would make you think), a worthwhile film that probably would have just slipped away if not for the Oscar nominations. So how did it get those nominations? Well, it benefited from a few different things. First of all, the critics groups don’t tend to distinguish when people do a great body of work in a year – so three critics groups gave their Best Director award to Steven Soderbergh, but they cited both this and Traffic (as opposed to the National Society of Film Critics, who just cited Traffic). That, plus Roberts’ performance, put it an early-in-the-year box-office hit on the awards radar (it was the biggest hit of the spring – the first film of the year to gross $100 million). Since it was already out on DVD before the awards season began, it was easy for people to see. It also seemed to benefit from a rule that people were uncertain about at the time. After 1938, a rule had apparently been instituted that prevented a director from being nominated twice for Best Director in the same year. Going into the nominations, no one was certain if the rule still held, but apparently it did not, as there was Soderbergh, nominated for both films. Too bad it couldn’t have happened in a different year, with two directorial efforts that might have deserved it. I enjoy reading your reviews so much that it seems churlish to point out that the indignation you show in each and every one of these posts is misplaced. The Academy isn’t interested in the best work of the year. You highlight examples of this in every post. So why the outrage with Chocolat or Braveheart or any other crazy nomination? Because that’s what they should do. And because sometimes they really do get it right, as we’ll see in some upcoming ones, or get it close enough to right. With Chocolat, it’s an interesting thing – not that they got it wrong (which I think they did), but that they went against all the historical precedents that said they were going to nominate Almost Famous (and still gave Crowe an Oscar). Minor nit, but it should be “Supporting Actress (Zhang)”. Ziyi is her personal name, not her family name. Russell Crowe’s performance is a real piece of movie star work – imagine what that movie would be like without him. Though Gladiator kicked off a revival of the historical epic/sword and sandals genre that could never quite recapture the success of the first. Though ironically of the several Scott/Crowe collaborations that would follow, I think the time the role really called for Scott (he would have been much more appropriate for the lead Kingdom of Heaven) he didn’t get it, but instead was later miscast as Robin Hood. As for the minor nit, the whole name thing always throws me, so I just go with the Western version. The same with Zhang Yimou. And of course, with Russell Crowe, I fully acknowledge that in the review. If not for Crowe, the whole film would probably be worthless. I agree that Robin Hood was major miscasting, but I loved Kingdom of Heaven and wrote about that in the Ridley Scott post for the Top 100 Directors. Do you think he should have been the lead, because he was way too old. The historical Balian was more like Crowe’s age. Since I think that the revised Balian’s character arc is the least impressive part of that movie (which I liked, overall, particularly for Edward Norton), I’d have preferred if Scott had gotten Crowe and done the character more as he really was rather than the young Bloom version. And I think Orlando Bloom can work as an actor (in LOTR and the Pirates films, for instance), but not in a role that asks for any real complexity. I’m shocked you liked Crouching Tiger so much the first time you saw it because every person I know who’s seen it has said that they really liked it the first time, but when they saw it the second time, they were blown away. This also applies to me. I’m also surprised that Chocolat ranks above Erin Brockovich. Chocolat is a good film that shocked everybody because it kind of came out of nowhere. But it has a charming cast and works as a romantic comedy. Erin Brockovich really doesn’t have much going for it outside the Roberts performance. Hell, you should see what Ebert had to say about it. As for Crouching Tiger, I was kind of pre-disposed to like it given the people involved. And of course, going to it was such an experience, that probably added to it. last time I watched Crouching Tiger I was disappointed, actually, I loved it at first, but a few years later, some of the orientalism hit me hard (perils of dating an asian at the time). I think DVDs did have an impact on this race because the studios were still sending out letterboxed VHS screeners, and a letterboxed VHS of traffic with an ugly scrawl on the bottom, versus the big sound and clear picture of the DVD of gladiator made a huge difference to people who had adopted the new format, I think. the next two years were transition years, 2001, the smaller, more nimble distributers sent DVDs and VHS because they were smart and hip to the new format, the second year, the studios had caught on and sent out about half DVD half VHS screeners and the year after that was the screener ban as studios freaked out over the immense piracy of the screener DVDs from the previous year. Ironically, I think it was the screener ban that really paved the way for Lord of the Rings Return of the King to sweep. When the academy was forced to see everything in a theatre that particular year they went for the most theatre friendly film, the film that most benefitted from being seen on the big screen versus being seen on a screener. Interesting analysis of how screeners changed things. But I disagree with your last notion. All the way back before the nominations were even announced in 2001, everyone was already talking about how Return of the King would win to be a cap for the trilogy. That two of the awards already won by the series (Cinematography, Sound Effects Editing) didn’t get nominations for ROTK, when they clearly deserved them, showed that it was headed for a sweep. Where the screeners probably made more of a difference that year was that Seabiscuit, which was already out on DVD, got nominated while Cold Mountain, which voters probably didn’t want to drag themselves to go see, didn’t. That, and the Harvey backlash. I remember hearing that ROTK would win before Fellowship even came out. But before Fellowship came out I remember a lot of people scoffing at the idea that it would get any nominations other than a handful of technicals. Half-a-Hobbit coming out this december will struggle to achieve goodwill from the academy since it is half a story and doesn’t really stand on its own because it doesn’t go anywhere on its own. I think it’ll earn a passle of technicals, but I seriously doubt it will earn the big nominations and Thorin a supporting actor nomination if they had done the story justice and made a single movie. Well, Galdiator was overrated, but it is not a bad film, Russell Crowe gives a good performance and the technical aspects are pretty good. For me traffic deserved the best picture award, it’s the best film directed by Sodebergh, great script, perfect casting and a wonderful editing. Crouching tiger was clearly the best among the nominees if you only take the technical aspects that work at perfection, but the story is not really great, it’s just ok., the performances are good but not great. Erin Brockovich is only a Julia Roberts vehicle, Albert Finney does a good job, but nothing more to talk about it. Chocolat is too sweet, the screenplay is very bad, the casting is fine, the music is beautiful, but the directing is terrible. The best actor of the year was Javier Bardem for his amazing performance in Before night falls, the best actress was Ellen Burstyn for her terrific portrait in Requiem for a dream, the best supporting actress Frances McDormand for Almost famous and the best supporting actor Benicio del Toro (who actually won the award) for Traffic. So basically Erik, Gladiator > Braveheart. I would have loved to see Traffic win something at the Nighthawks. I thought it was the best film of 2000 myself. But Crouching Tiger, Hidden Dragon is in my Top 5 for the year. Either way, both films were more deserving of the award than Gladiator will ever be.